Why and how to read the charts in Customer Service report. 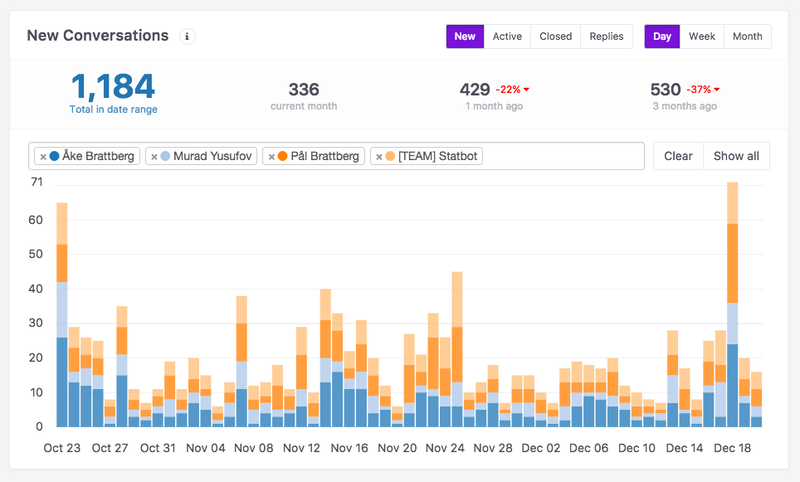 Customer Service report will let you see how your teammates and teams are performing. And who doesn't want to improve their Customer Service? 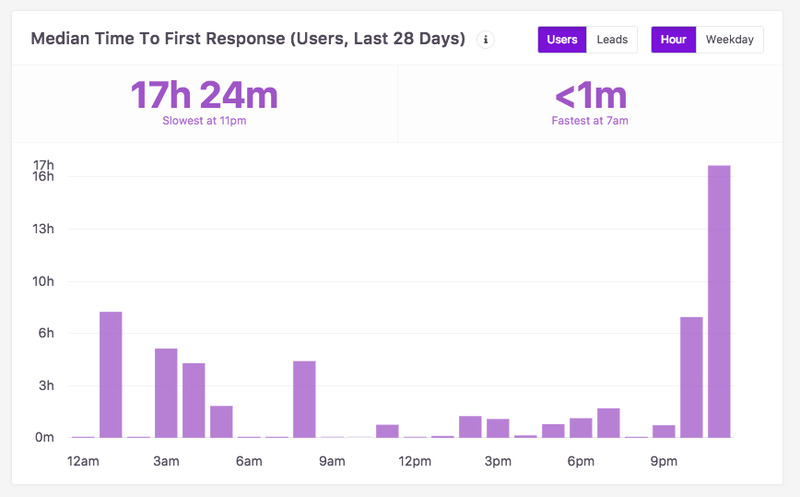 At what time of the day (and day of the week) do customers talk to us? How much time do we take to respond? 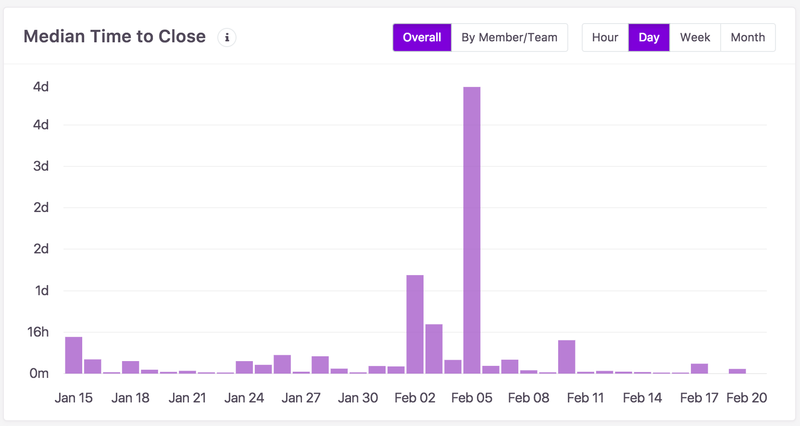 Replies: number of replies created in given period and authored by a certain member/team. Note: if a conversation is assigned to a team, but messages are written by members, we count them towards members, not teams. More on Replies and how we count those can be found here. 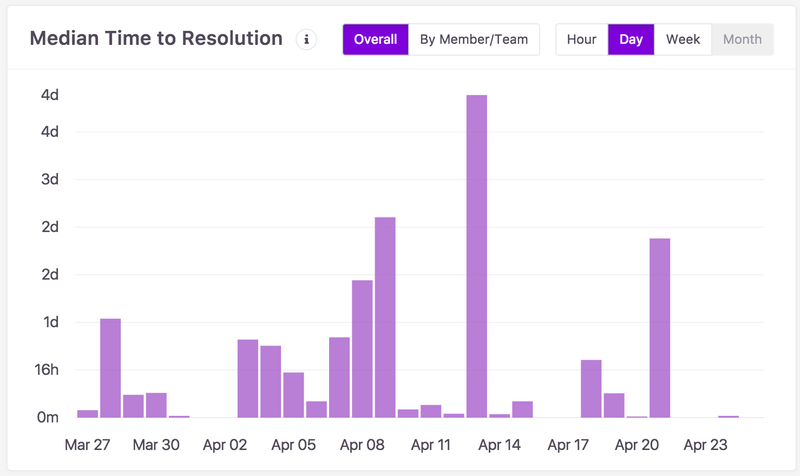 Tooltip shows amount for the admin/team you hover over and total for all selected members/teams for this date. 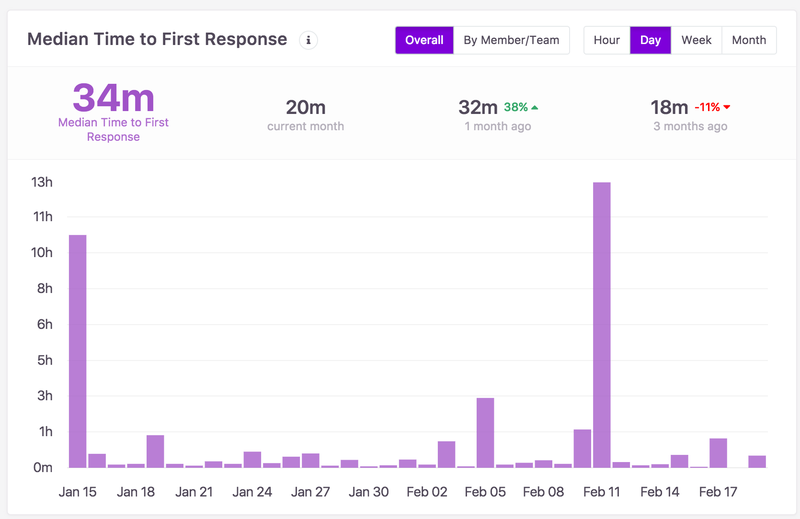 Let's calculate median response time for January. Suppose you have team members Alice and Bob. There's 13 conversations _started_ in January. 5 are assigned to Alice and 8 are assigned to Bob. Alice responded to 3 conversations in 1 minute, to 1 conversation in 10 minutes and didn't respond to 1 conversation. MTtFR for Alice is median for the following array: [1, 1, 1, 10], which is 1 minute. Bob responded to 1 conversation in 1 minute, and to 7 conversations in 30 minutes. MTtFR for Bob is median for [1, 30, 30, 30, 30, 30, 30, 30], which is 30 minutes. Overall MTtFR is median for [1, 1, 1, 1, 10, 30, 30, 30, 30, 30, 30, 30], which is 30 minutes. In case you don't know this, median value is the middle value in sorted array. Suppose, we have response times: [1, 2, 2, 2, 2, 2, 200]. Median for this array is 2, while average is ≈30. Let's calculate median time to close for January and February. Suppose you have team members Alice and Bob. There's 2 conversations _started_ in January, one for Alice and one for Bob. U, Jan 31, 9:00: What is the answer to answer to life, the universe and everything? U, Jan 31, 9:00: Explain this to me! Alice's result in January is median for array , which is 10 minutes. Bob's result in January is median for array , which is 30 minutes. Bob's result in February is median for array [10, 30] which is 20. It's kinda complicated. If you don't get this, message us, we'll try to explain it better! 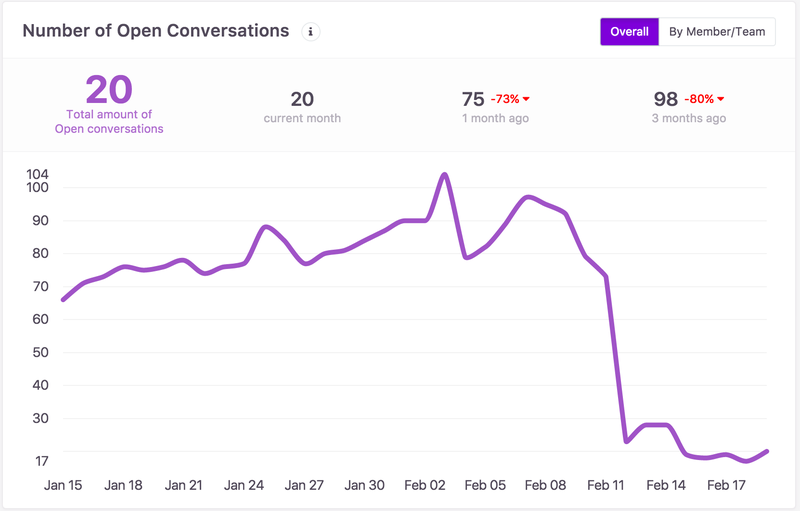 This metric simply shows median time between the conversation open time and the conversation last close time for all conversations started in given period. NOTE: This chart can be changed retrospectively! E.g., suppose there's one open conversation on Apr 13th. It's not closed yet, so there's no data for that date. Then your teammate closes it on 14th, so the result for 13th is roughly 1d now. Then your customer reopens it, and you close it on 15th, so the result for 13th is 2d now. If customer opens it after 2 months, result for 13th will change again. And when you close it, the result will be something like 60d. Amount of conversations that stayed open at the end of particular day. Fractions of when conversations are started by the hour of day or day of week. Note: this is not affected by changing date range. 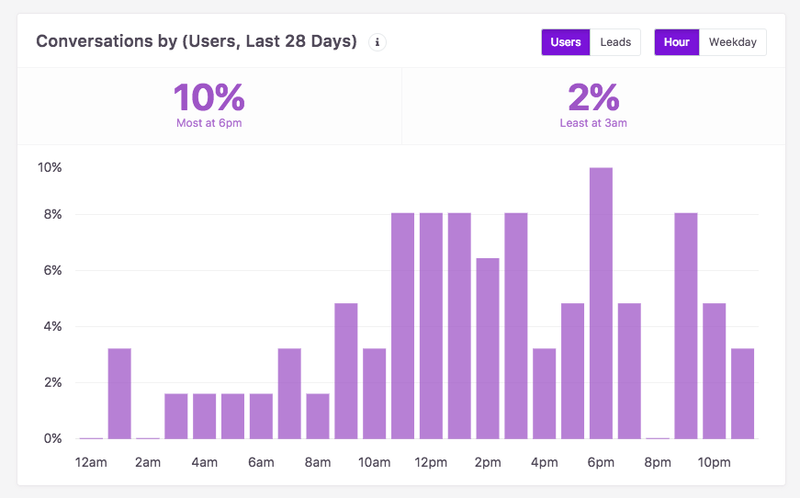 Same as the previous MTtFR chart, but we take only conversations started by users/leads in specific hour of day or day of week. Simple interactive (you can sort and search it) table with total admins/team-member stats.